The Six Nations rugby championship starts tomorrow, so here’s a quick guide to each of the host cities. Information about the fixtures can be found here. London is one of the most recognisable cities in the world, and it has been a major settlement for two millennia. The Six Nations venue is Twickenham Stadium which can hold 82,000 people and is the fourth largest stadium in Europe. If you have some spare time when visiting London, our three places to visit are: the British Museum – a huge museum dedicated to human history, art and culture, the Tower of London – where they keep the crown jewels, and Big Ben – the big clock tower by the Houses of Parliament. Cardiff has been the capital of Wales since 1955 and is the cultural and sporting hub for the country. Six Nations matches will take place at the Principality Stadium (also known as the Millennium Stadium) which is the national stadium of Wales. When visiting Cardiff, we recommend visiting: St Fagans National History Museum – an open air museum about the historical lifestyle, culture and architecture of Wales, Doctor Who Experience – full of props, sets and costumes for anyone who loves Doctor Who, and Roath Park – a lovely park with many features including a lake for rowing and fishing and a large playground. Edinburgh has been recognised as the capital of Scotland since at least the 15th century and is well known for its fringe festival, which is the world’s largest arts festival. The Six Nations venue, Murrayfield Stadium, has a capacity of 67,800 making it the fifth largest stadium in the UK. If you’re planning on staying in Edinburgh a bit longer, we suggest going to see: Arthur’s Seat – a large fort 251 metres above sea level giving a fantastic view of the city, Edinburgh Castle – a historic fortress that is Edinburgh’s most frequently visited attraction, and the National Museum of Scotland – a free museum full of antiquities, natural history and Scottish culture. Dublin is the capital of Ireland and is a centre for arts, education and industry for the country. All Six Nations matches in Dublin will take place at Aviva Stadium, formerly known as Lansdowne Road Stadium, which hosted the Europa League Final in 2011. While visiting Dublin, other attractions you should visit are: The Book of Kells – located in Trinity College this exhibition is a must-see, the Guinness Storehouse – one of Ireland’s most popular tourist destinations all about the history of Guinness, and Kilmainham Gaol – one of the largest unoccupied jails in Europe focusing on some of the most heroic and tragic events in Ireland’s history. Rome, the capital of Italy, has a huge amount of history with many ruins and places of interest, in fact its historic centre is a UNESCO World Heritage Site. Rome’s Six Nations venue is Stadio Olimpico which has hosted four European cup finals, including the 2009 UEFA Champions League final. 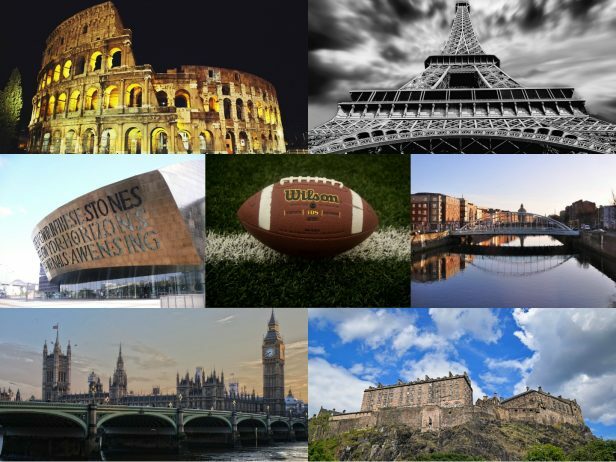 If you’re staying a few days why not visit some of these amazing tourist destinations: the Colosseum – simply stunning and one of Rome’s most popular attractions, the Vatican – including the Sistine Chapel with its ceiling by Michelangelo, and the Trevi Fountain – a beautiful fountain where people come to make wishes. Paris, also known as The City of Light (or City of Love), is the capital, and largest city, in France. Six Nations matches will take place at the Stade De France which is the sixth largest stadium in Europe and is also used for football matches and concerts. While you’re there, why not see some of the local attractions, such as: the Louvre – the world’s largest museum and the second most visited art museum in the world, the Eiffel Tower – finished in 1889 this iconic tower is the most visited paid monument in the world, and Notre Dame – a medieval cathedral which is widely considered one of the best examples of French Gothic architecture and is among the most well known churches in the world.